Beef is the key ingredient to higher grocery bills in Wisconsin. 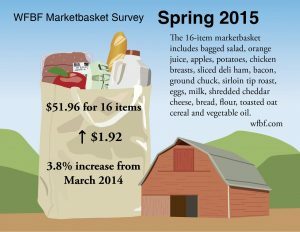 The Wisconsin Farm Bureau’s Marketbasket survey shows the total cost of 16 food items that can be used to prepare one or more meals is $51.96, up $1.92 or about 3.8 percent compared with a survey conducted a year ago. The average price for the survey’s two beef items (sirloin tip roast and ground chuck) made up 77 percent of the overall increase. The survey found the average price of one pound of ground chuck rose 21 percent compared with last year, from $3.86 to $4.67 per pound. One pound of sirloin tip roast increased more than 13 percent from $4.85 to $5.52 per pound. Of the 16 items surveyed, 10 increased in price while six decreased in price compared with Wisconsin Farm Bureau’s 2014 spring survey. “Reduced production of citrus brought on by drought led to a 7 percent increase in the price of orange juice over the past year,” Langan said. The prices for several items are headed downwards due to spikes in production. A decrease in the price of boneless chicken breasts by nearly 6 percent since last fall is credited to an increase in poultry production and lackluster exports. Bacon and sliced deli ham also saw price decreases due to a significant increase in the nation’s hog herd. Increased production led to price decreases for apples and dairy products. Wisconsin’s $51.96 Marketbasket is $1.91 less than the American Farm Bureau Federation’s national survey of the same 16 food items. AFBF’s survey rang in at $53.87 (a 3.5 percent difference). “Several meat items increased in price, accounting for much of the modest increase in the Marketbasket,” said John Anderson, AFBF’s deputy chief economist. “The 1 percent increase shown by our survey tracks closely with the Agriculture Department’s forecast of 2 percent to 3 percent food inflation for 2015,” he said. During the last three decades retail grocery prices have gradually increased while the share of the average dollar spent on food that farm families receive has dropped. In the mid-1970s, farmers received about one-third of consumer retail food expenditures in grocery stores and restaurants. Since then that figure has decreased steadily and is now about 16 percent, according to the U.S. Department of Agriculture. Using that percentage across the board, the farmer’s share of this quarter’s $51.96 grocery bill would be $8.31. Despite higher prices, the USDA says Americans will still spend approximately 10 percent of their disposable annual income on food, the lowest average in the world. The Marketbasket survey is a quarterly look at the trends in food pricing in Wisconsin in relation to changing farm prices, weather and wholesale and retail food marketing. Members of the Wisconsin Farm Bureau collected price samples of 16 basic food items in communities across Wisconsin in March. 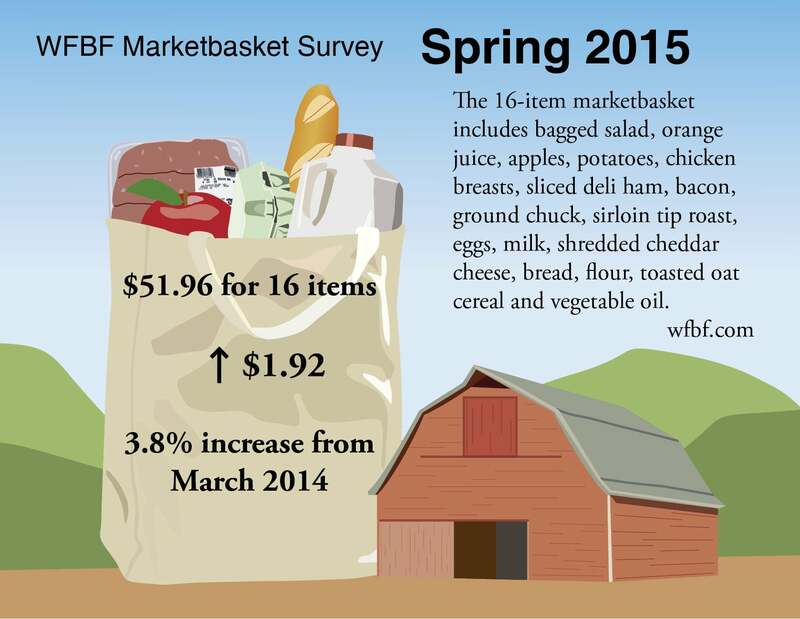 The Marketbasket Survey is an informal measure of prices at grocery stores in Wisconsin. The prices reported reflect variations in communities and retailers. The prices reported are not validated by any outside source. Prices were collected for this survey in the communities of Appleton, Ashland, Beloit, De Pere, Durand, Eau Claire, Edgerton, Elroy, Kewaunee, Manitowoc, Marshfield, Medford, Menomonie, Mequon, New Richmond, Platteville, Richland Center, Saukville, Shawano, Sparta, Watertown and West Bend.